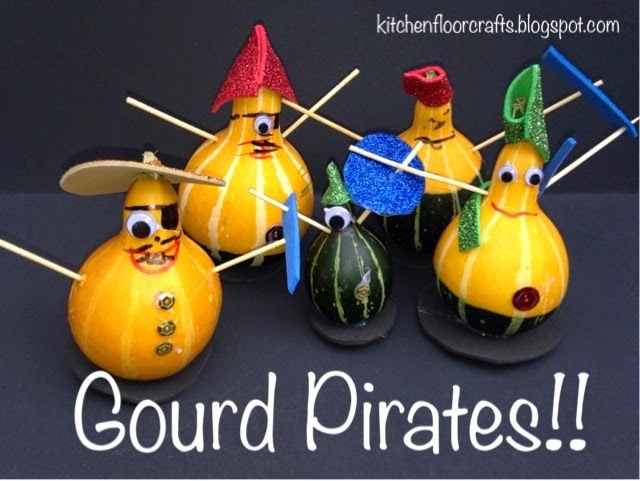 Kitchen Floor Crafts: Gourd Pirates!! 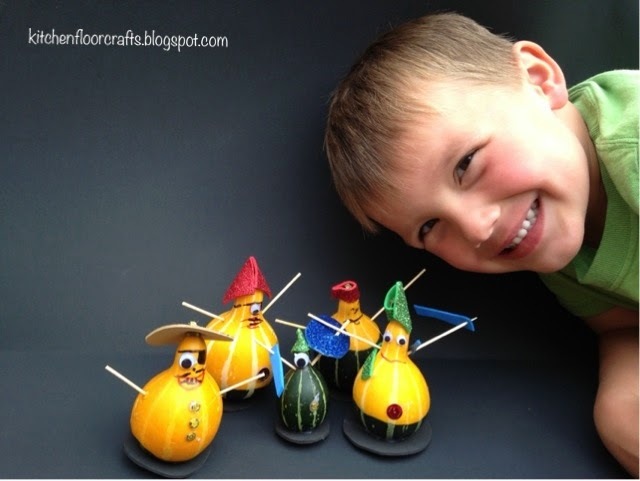 This week we've been exploring some fall fun with miniature gourds. On the day we were picking up some at the farm stand Big Brother became inspired with his own project idea: GOURD PIRATES. He eagerly picked out his own gourds and actively began making a plan for when we got home. 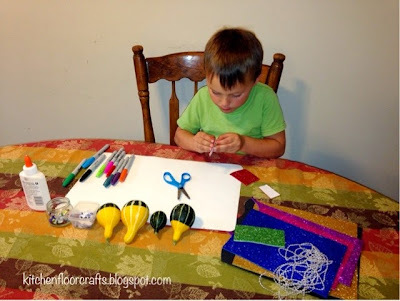 Big Brother listed out all the items that he needed and together we gathered the supplies he wanted: craft foam, permanent markers, sequins, scissors, tooth picks, googly eyes, and the hot glue gun. I was still having a hard time imagining his vision, but as he eagerly got to work he clearly had a plan. As he worked I began to see some of his plan come through. He used the markers to draw faces, the sticky craft foam to create hats, and the toothpicks to make arms. With my help he glued on some googly eyes and "belly buttons." We also wound up creating and gluing on circle bases to hold the pirates steady. I loved seeing Big Brother take the lead on this craft, follow through on his plan, and come up with such a great finished product! He was really pleased with his work, and named each of the pirates after some of us. Big Brother made four of the gourds primarily on his own, eventually I couldn't resist and had to make one too! 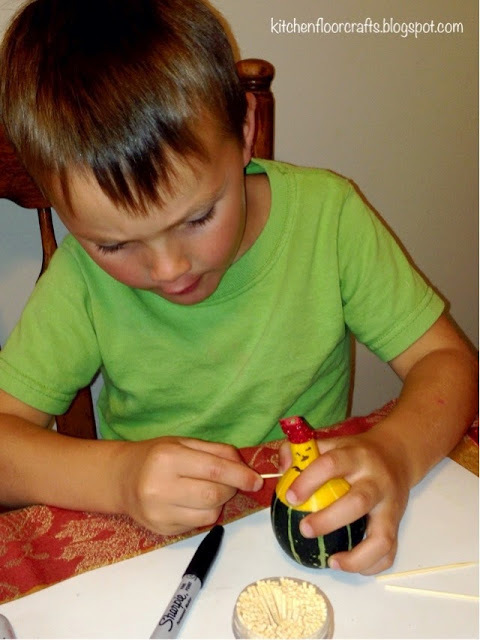 Although it's not a typical fall craft, we really love how this project turned out and are happily using them as a fall decoration. 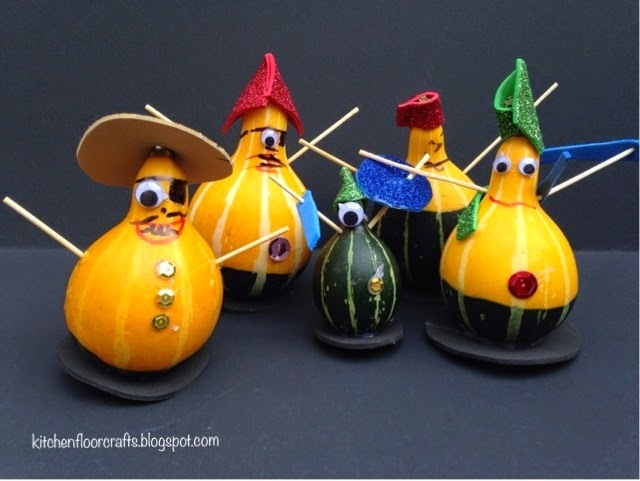 We're looking forward to some other types of gourd play and creativity!